Each season, an orchard air blast sprayer may apply materials worth $500 to $1,250 per acre. Many of the materials applied have the potential to protect the fruit and tree from pests, provide nutrition, or regulate the tree or fruit growth. However, the failure to apply a spray evenly to its target can cost the grower much more than the original price of the material and the $35/acre application costs. Poor spray coverage, especially on larger trees, is the primary cause of reduced spray product performance. Furthermore, orchard air blast sprayers are especially tricky to calibrate properly. Variations in tree structure, the time of season, and the purpose of the spray require frequent adjustment to the sprayer output and the application speed as the growing season progresses. These adjustments are often bypassed because sprayer calibration and adjustment is considered difficult and time consuming. Surveys have shown that the average small acreage grower could save over $1,500 per year in spray material costs alone by investing a few hours and dollars in maintaining and adjusting their sprayers. Advances in agricultural chemicals have made precise application of pesticides much more important, not only because of the cost of the chemicals, but also because of the danger of off-target spray drift. The economic impact of spray drift comes not only from the loss of chemicals that should have been applied to the crop, but also from: the potential damage the chemicals may cause to those adjoining crops and property; the contamination of surface and ground water supplies; and the health risks to animals and people. Legal liability costs have been rising recently, justifying the added attention to properly calibrated and operated spraying equipment. Problems with inadequate pesticide efficacy and phytotoxicity are often due to inaccurate sprayer calibration and pesticide dosage. Chemicals should be applied at the proper rate to be effective and safe. The calibration test determines the application rate with our selected nozzles, pressure, sprayer design, and travel speed. The operator must know the application rate (from the chemical label) to determine the proper amount of chemical(s) to add to the sprayer tank. Once the actual application rate is known, it is easy to determine the acreage that a tankful or part of a tank will cover. Then, the proper amount of chemical to add to the tank can accurately be calculated. Chemicals must be applied at the correct rate. Using more than the desired amount of chemical is wasteful, and may violate label rates, cause phytotoxicity, and pollute the environment. Too low of an application rate will reduce the effectiveness, and money will have been wasted on the material and its application, plus decreased pest control may result. Many orchardists forget how a mis-calibrated sprayer could cause over thinning or under thinning the crop, and on some fruit trees both can occur in the same tree. In either case, this can affect the profitability of the orchard and can be prevented with proper calibration and checking the spray deposition. Actual application rates in the field may vary from nozzle catalog values because of pressure gauge error, wheel slip, speedometer error, and friction loss in the plumbing. A catalog is satisfactory for selecting the correct nozzles, but the sprayer must be checked under actual operating conditions to adjust the pressure and/or speed for the exact application rate required. Also, the spray pattern on the left side of some sprayers is different from that on the right side. This is difficult to detect without special apparatus. A uniform ground speed is necessary to maintain even spray application. The spray application per acre varies inversely with the ground speed of the sprayer. If the ground speed is doubled the application rate is cut in half and as the ground speed is reduced in half, the spray application is doubled. Rate controllers can only compensate for this within certain limits and can sometimes have a negative impact on spray coverage. The flow rate through the nozzle varies with the tip size, the pressure applied, and the condition of the tip. Before checking the spray pattern, inspect your sprayer and all of its components to be sure that it is set up correctly, the pressure is correct, the nozzles are at the correct height for the crop being treated, the distances between the nozzles are correct, and verify the nozzles are not plugged. Test the sprayer at the same speed (RPM, gear, and throttle setting) you plan on using when treating the intended crop or area. Put CLEAN water in the tank for the testing. Orientation of the nozzles affects the spray pattern being emitted from an air blast sprayer. Traditionally nozzles are positioned radially around the air outlet of the sprayer. 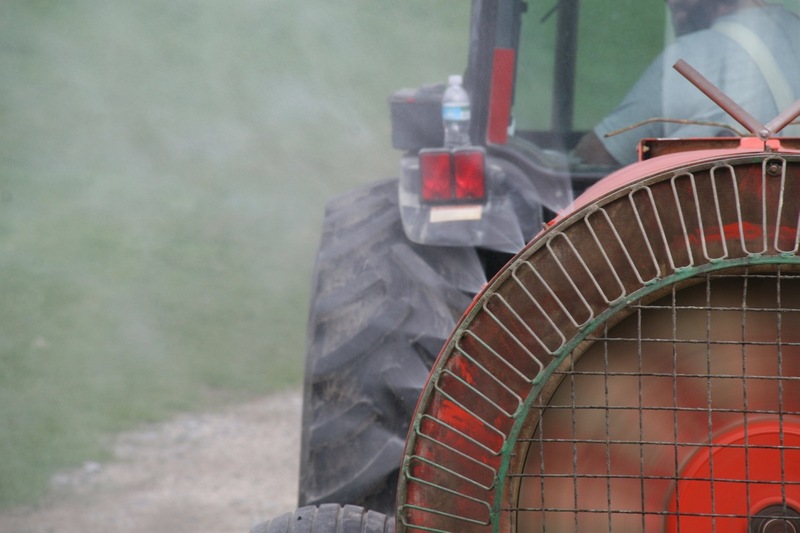 The air blast, on a counter-clockwise fan rotation, carries the droplets upwards over the canopy on the right-hand side of the sprayer and downwards on the left-hand side. Use water sensitive cards to determine spray pattern or deposition. These are available from some pesticide suppliers, plus many spray equipment dealers. Each card is used just one time. Wherever a drop of water or oil touches the yellow card, that spot turns blue. Set up a series of cards on the crop you intend to spray. For an orchard, set cards at the top of the canopy (on a pole for example), in the interior, and low in the canopy. Marking the position on each card with a pen is helpful. Often we use clothespins to clip them onto the plants. Run the sprayer once by the row or block, then retrieve the cards to see what coverage you had. One option to make the spray deposition pattern visible is to put a kaolin-clay based spray (like Surround) or a dye in the tank, and spray test plants. If this is a crop, you’ll have to use a material that is approved for the crop. This method is fairly quick, and in some cases it is very easy to visualize gaps and overlaps. You may have to let the material dry for a few minutes to clearly see the results. Often the materials wash off with the next rain. A vertical patternator is used to simulate the canopy; it is placed at the end of the row, in-line with the trees. The sprayer is stationary, then turned on and CLEAN water is sprayed out of the nozzles with the fan turned on. Water is collected in the graduated cylinders. The results show the vertical distribution pattern. Different nozzle configurations (number and orientation) are selected and vertical spray patterns become visible on the patternator. Results from the patternator show great variability in spray pattern produced according to nozzle orientation and which side of the sprayer they are on. Remember, the rotation of the sprayer air can affect spray coverage. Vertical spray patternators are used in Europe for the inspection and calibration of orchard sprayers. However, little information is available about their reliability, particularly when used for crop-specific calibration. Vertical spray patternators can aid in adjusting nozzle position and orientation if changes are made according to fruit tree canopy size and geometry. Triple rinse tank and piping. Take special care to flush manifolds and nozzles. Be careful if using pressure wash sprayers. This may force water into sealed parts like bearings. You can use push brooms and hoses to scrub them off. Pay special attention to cleaning both sides of nozzles, around the pump, and filter. Clean nozzles and record orifice and whirl disc sizes. Do not use any metal object when cleaning sprayer tips. Flush out line to pressure gauge. Clean filters, including tank filters, suction filters, final filters, and every screen behind nozzles. Make sure all valves, diaphragms, and O-rings are in good condition and working properly. Check tire pressures on both sprayer and tractor. Make sure tachometer is working on the tractor. Fill sprayer ½ full with clean water. Have any operators or mechanics that work with the sprayer/tractor combination on hand for the sprayer calibration. Have sprayer operator’s manual on hand. The attached worksheet, “Air Blast Sprayer Calibration Worksheet” can be used to calibrate an air blast sprayer. The worksheet is organized in a step-by-step process. Record the general information dealing with farm, tractor, and sprayer (½full with water). Measure a distance (the longer the better, like 264 or 352 feet) in the orchard that you can time in seconds how long it takes the tractor and sprayer to cover a given area. Time the tractor and sprayer in both directions and calculate an average. Operate the tractor and sprayer in the gear and engine RPM that you normally operate the sprayer when spraying. You should be operating the sprayer with the fan running. The time it takes to travel the marked off distance should not be different by more than a second or two. If greater than a second or two, time another set both ways. The speed on the tractor speedometer or tachometer can be different than the actual speed due to tire wear or if different tire sizes were put on the tractor. Once an average time over a given distance is determined, then the Miles per Hour (MPH) and Feet per Minute can be calculated on the worksheet. Transfer Feet per Minute to the back of the worksheet. Go to the orchard and measure the row width in feet (distance between tree rows). Record distance between tree rows on the worksheet. Now the number of feet that need to be travelled to spray an acre of orchard can be calculated on the worksheet. Transfer this number to the back of the worksheet. Nozzle tip size and disc core size were recorded in the “Pre-Calibration Instructions” and should be recorded on the second page of the worksheet. In a safe place, operate the tractor in-place (without moving) at the given engine RPM and pump pressure. Measure the volume output of each nozzle on both manifolds. To determine the left versus right side, look at the sprayer from behind. You can spray with the fan “off” while you are collecting the nozzle volume output. Record volume output per nozzle per minute. If recorded in fluid ounces per minute, convert into gallons per minute. Recall that 128 fluid ounces are in 1 gallon. Add the Total Output in Gallons per Minute (GPM) for each manifold and compare them. There should be less than a 5% difference between the right and left manifold of the sprayer. Add the output in gallons per minute of both manifolds together to calculate the All Nozzles Output for the sprayer in gallons per minute (GPM). Calculate the Minutes to spray one acre (MPA) by taking the “Linear Feet Row per Acre” (that was calculated earlier) and divide it by the “Feet per Minute” the tractor and sprayer is being operated at (that was calculated earlier). Determine Gallons to spray for one acre (GPA) by multiplying Gallons per Minutes (GPM) the sprayer is spraying times Minutes Per Acre (MPA) it takes the sprayer to spray one acre. At the given operating speed, engine RPM, pressure, and nozzle types and sizes, the gallons per acre is what the sprayer is applying to one acre. Changing any of the given factors will change the gallons per acre being applied. Remove the nozzles and strainers; flush with clean water regularly (at least the end of each day of use). Use a soft brush or a can of compressed air (for cleaning keyboards). Never apply corrosive fertilizer solutions through an air blast sprayer. Remove and clean strainers after completing the spray application, or when products change on sequential applications, whichever comes first. Nozzle wear occurs most rapidly when wettable powders, flowables, or dispersible granules are applied, especially at high nozzle pressures. Under these situations, the tips and cores on the nozzles should be manufactured from hard, wear resistant materials. The abrasion resistant nozzle components cost more initially, but in the long term are quite cost effective. Recording your sprayer calibration calculations for future use is important. By maintaining a record, you can compare your sprayer calibration calculations from calibration to calibration. Recordkeeping is also due-diligence and is important to have on hand if a question arises about product residue, pesticide drift, or any other spray complaint.